So now you have your reference PC built up exactly the way you want it? Fully patched with all applicable updates applied? All drivers and BIOS updates applied?Before you sysprep it do a bit of cleanup first. Ccleaner does a great job of cleaning up many high traffic areas: browser caches, histories etc, temp files, logs, and registry settings. DEP, system restore, and anti-virus all set? If you will be attaching imaged PCs to your network infrastructure your management and security policies will likely take care of many of the other settings you'd otherwise be concerned with. For the first use you will need to copy install.wim from the Sources folder on the Vista CD.If you want to use multicast with WDS then use the install.wim from a Server 2008 DVD. You may get an error in WSIM when opening the wim complaining about not finding wimgapi.dll. 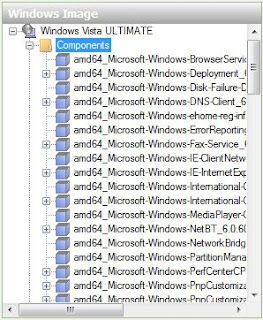 This dll lives in the <waik install\tools\<architecture> folder. You need to copy the appropriate version of this file to \system32 on the technician PC. So if you are running Vista x86 you need to use the x86 version of the dll otherwise you will get more errors. Once the wim is selected in WSIM you will be prompted to open the catalog file or create a new one. This will take a cool minute. In the bottom left, expand the components container. This process now becomes like Group Policy editing where the sky is the limit. I generally use 5 components which control settings very much like setup manager did. All further customization will be handled via GPOs or other management infrastructure. Once the capture completes you'll be able to verify if your sysprep was successful when the reference PC reboots and begins the setup process. To deploy your new image to other PCs you can use WDS or deploy locally using your PE disk. If deploying locally, boot to PE then run diskpart from a command prompt to make sure the drive is set up properly first.